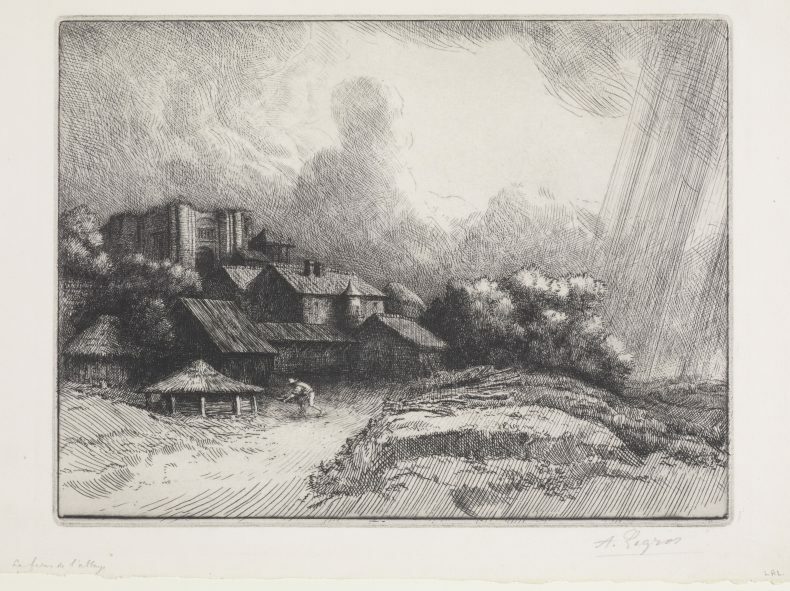 Art history student and recent intern Lily Pare Hallbutcher shares her passion for the prints of Anglo-French artist Alphonse Legros (1837–1911), focusing on some key works: Farm at the monastery, Sir Charles Holroyd, The Triumph of Death, and Angler. 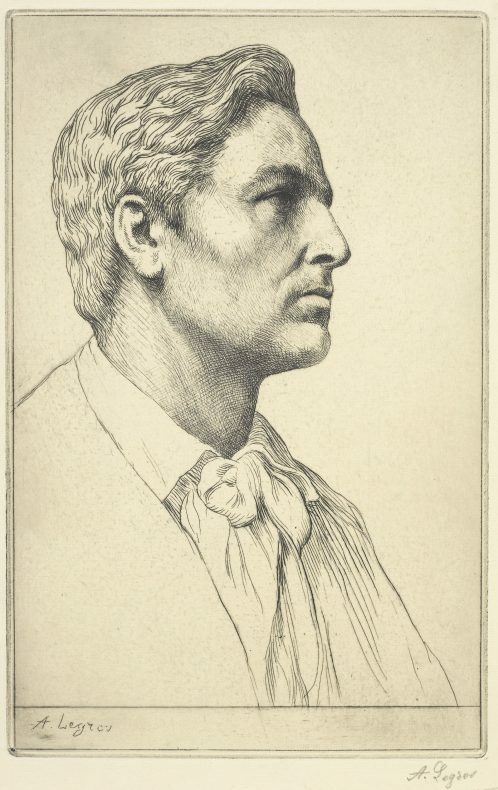 ‘Weirdness’ was how the great critic of etchings, Sir Frederick Wedmore (1844-1925), summed up the early prints of Alphonse Legros. Set against the sensible portraits, pretty landscapes, and pious religious imagery with which Legros made his name, this description may seem strange. But it suggests the slippery nature of his art and personality: acceptably Victorian, yet eccentric. Legros spent much of his life as an outsider, an undereducated provincial in Paris and then a Frenchman in England. Yet he could turn his eccentricity to his advantage, and he was undeniably charismatic and witty. Scrutinising some of his 25 prints in Te Papa’s collection provides fascinating insights into his art and life. Superficially, his scenes of peasants, landscapes, and portraits may seem unremarkable. Look again however, and they emerge as the work of an extraordinary alien. The prints of Legros are little worlds. Carefully composed with delicate drypoint line, they capture an instant in time: a tree branch caught in the wind, a woman’s head bowed in prayer or an artist’s eyes, staring into the distance. He invests the smallest details with great feeling. You sense that the scene before you is just a small part of a much larger story which you feel compelled to reconstruct. Farm at the Monastery (La ferme de l’abbaye) does just this. A lone figure dashes across the long grass of the midground: a bearded farmer in a straw hat, hurrying to get a tray of produce or seedlings into a straw-thatched shack before the rain – already sweeping in from the east – begins in earnest. Behind him are the majestic and shadowy abbey buildings, romantically rising out of the rocky landscape. Legros has used a heavy, dark line to depict the abbey, conveying the solemn contemplation within. The farm is denoted by loose lines and lots of white space, giving it a sense of informality in contrast to the abbey. The weather is unpredictable: sunshine breaks through the windswept clouds to the west, while rain threatens from the east. Four seasons in a day, just like our Wellington weather! That poor farmer has probably been running back and forth all day, trying to catch the sun and avoid the storm. Tellingly, Legros depicts the farm at the back of the abbey, the working area removed from ceremony and sacrament. He fully appreciated the physical labour that makes monastic life possible. At 14, he had worked on frescoes for the Chapel of Cardinal de Bonald in Lyon Cathedral and would have observed all the activities that go on in religious spaces. Legros had grown up in a poor rural family and was sent out to work at the age of 11. He knew full well how an abbey would use any abundance of produce or skill ‘to provide care to the poor and needy, refuge to the persecuted or education to the young.’ In Farm at the monastery we can see how he identified with the rural labourer but still appreciated the dramatic beauty of a stormy sky. Legros did not stay in the countryside – or indeed France. In 1863, after training in Paris (including a stint creating scenery for the fabulously elegant Opera house), he moved to London. Speaking no English, he was befriended by Frances Rosetta Hodgson, the only person at his lodgings who understood French. After they married the following year, Frances became his secretary and interpreter. Legros was by no means lonely in London though, having moved there at the suggestion of his friend, the legendary painter and etcher James McNeill Whistler. He was quite a star at parties, bursting into Offenbach’s greatest hits at the drop of a hat! We get a sense of Legros’s friendly personality in the portrait of his former student Sir Charles Holroyd. It is drawn with a light, sketchy technique. He has simplified parts of the portrait such as Holroyd’s hair and cravat, giving it a deliberately unfinished look, somewhat like the virtuoso qualities of Anthony van Dyck’s etchings 250 years earlier. Holroyd appears in the middle of a daydream, staring off into the distance, out of the frame. 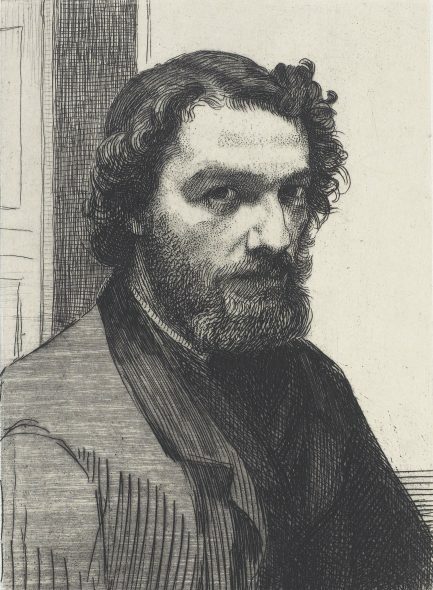 When Legros etched his portrait, Holroyd was no longer just his student but a leading figure in the London art world, as first keeper of the National Gallery of British Art at Millbank (now Tate Britain). Yet Legros reveals the artistic, musing side of Holroyd’s personality rather than his importance. The two men were likely close. Because Legros never learned to speak English despite living for nearly half a century in London, as a professor at the prestigious Slade School of Art he relied on teaching by demonstration (with lots of grunts and laughter), and on talented students like Holroyd who would interpret for him. As we’ve seen, Legros had a knack for giving the simple subject of a landscape or portrait a sense of narrative, drama, and emotion. What could he do if given a real opportunity to stretch his imagination? In the 1890s he embarked on a series of prints that fully drew on his ‘weirdness’, as well as his skill at portraying drama and emotion. The series is the Triumph of Death, with the foreboding figure of Death coming to take away the souls of the sinful or unfortunate. Te Papa owns just one print from this rare series, Triomphe de la mort: La mort balaie les vices. (Triumph of Death; Death sweeps away sinners). 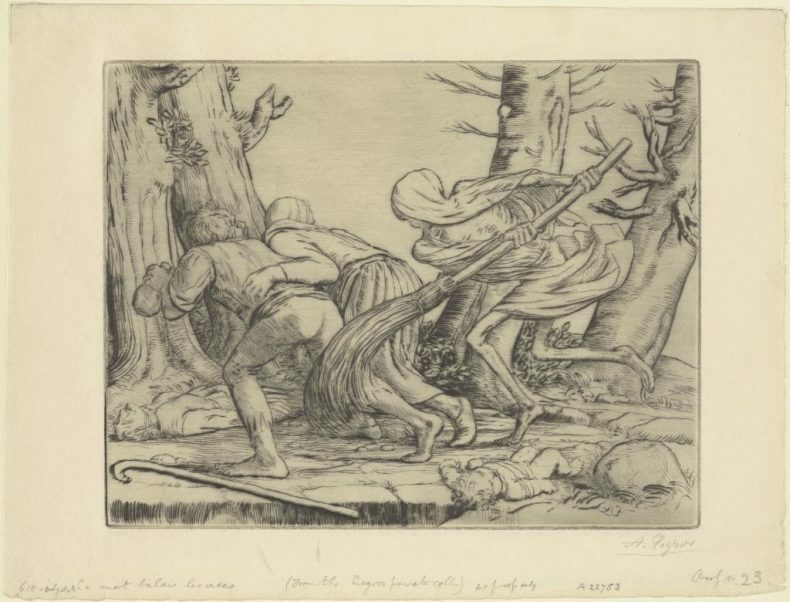 Legros depicts the moment of Death descending on a family in a forest clearing by a wayside. The robed, skeletal figure, wielding a broom, drives two adult figures, male and female, away into the distance. Another adult male figure lies by the trees, ignored by Death. Perhaps he has predeceased the couple or – less likely – has survived the arrival of Death. The couple, clothed in rags, cling onto each other as they are driven away, without looking back. The man also clutches a bottle. Clearly, these are two peasants whose weakness for the demon drink has led to their untimely deaths. Separated from the couple and lying at Death’s feet is a helpless and now orphaned baby. If this gothic turn seems unexpected, we should remember the drama of the stormy sky and shadowy abbey, hinting at a more melancholic strain in Legros’s art. In his student years, he was evidently a fan of tales of the macabre, drawing unpublished illustrations for a proposed French translation of Edgar Allan Poe’s classic Tales of Mystery and Imagination. 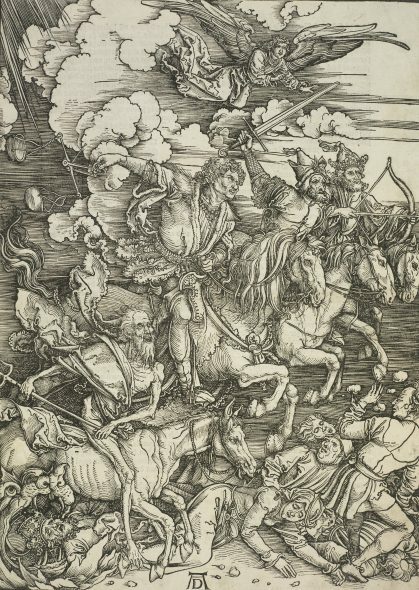 Legros’s depictions of the personified figure of Death were also probably inspired by Albrecht Dürer’s The Four Horsemen. From: The Apocalypse. (1498) and Hans Holbein’s skeletal depictions of Death in prints such as The mendicant friar. We mustn’t overlook the influence of Legros’s rural upbringing here. Art dealer Peyton Skipwith notes: ‘the transformation of the reaper into Grim Reaper was as natural a part of Legros’s artistic repertoire as it was of the mythology and folklore of rural Burgundy’. The Victorians lived with death as part of their daily lives in a way that is hard for us to understand today. Sadly, Legros knew the triumph of death too well; of the nine children he had with Frances, three died in infancy. When he died in 1911, he was buried alongside his children. This is altogether too sad a note on which to leave Legros. So, let’s consider one more print which summarises the mix of realism and daydream that makes his art so compelling. 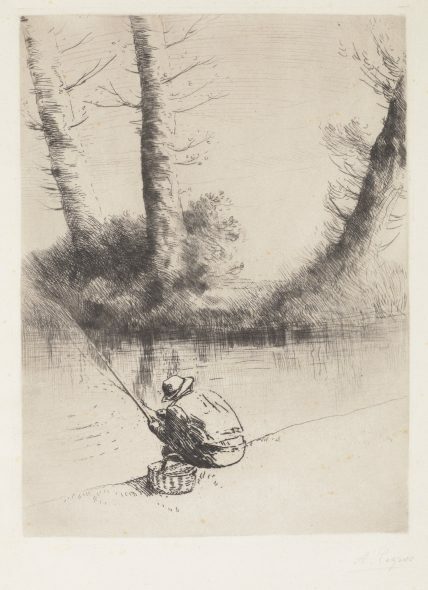 Angler (Le pêcheur à la ligne) depicts a single fisherman seated on a river bank surrounded by trees. Skilfully using his needle, Legros creates a ‘burr’ of metal on the plate, producing a rich, velvety line which gives texture to the branches and bark of trees. The line creating the trees and grass of the riverside landscape is soft and free. This conveys the wild, unpredictable character of nature. In contrast, the line illustrating the fisherman’s figure is hard and firm. This signifies how the angler is absorbed in the physical labour of fishing, while imagining the world beyond the river as a place ruled by nature. Excellent blog Lily. Well done. Although an outsider, Legros passed on his skills to a generation of British etchers like Frank Short whose work enjoyed enormous popularity until the Crash of 1929 ended the craze for etchings.